Positive: Compact size; decent hardware; nice display; full connectivity; good price. 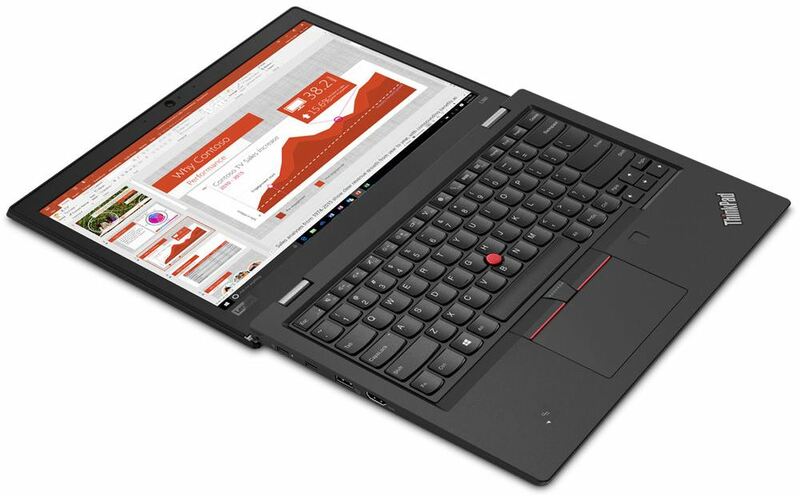 The Lenovo ThinkPad L380 Yoga is a 13-inch business notebook that offers a versatile 2-in-1 design and swift 8th-gen performance. It has a MIL-STD 810G durable chassis that is able to withstand extreme humidity and temperatures, vibration, high altitude, sand and dust, solar radiation, fungus and mechanical shock. On the security side, the ThinkPad Yoga can be outfitted with Intel vPro for remote management. Lenovo preserved the external ThinkPad look and feel. With dimensions of 321.8 x 224 x 18.8 mm and a weight of 1560 g (3.44 lbs), the L380 Yoga is a thin and light laptop. The exterior sports a sleek dark-silver finish over its aluminum lid, accompanied by a steel-colored ThinkPad logo protruding from the top left corner. As for the hardware specifications, underneath that tough hood lie a 1.6-GHz Intel Core i5-8250U processor, 8 GB of RAM, a 256GB SSD, and an Intel UHD 620 graphics card. The ThinkPad L380 Yoga is easy to maintain and repair, because it was designed to be opened with a regular screwdriver. From there, users can change the RAM (1 slot, 32 GB max) and SSD-m.2 module. This is a great way to upgrade later in the laptop’s lifecycle, when those components become much cheaper. The L380's 13.3-inch, 1920 x 1080 LED backlit display offers plenty of detail and vibrant colors. It is an IPS Full-HD display with a glossy finish. A matte finish is unavailable, as it is a glass display. The L380 Yoga is 95% sRGB color space accurate, which makes the device suitable even for semi-professional image processing if necessary. However, the display is simply not bright enough to counteract reflections in direct sunlight, and equally so in the shade. With a soft palm rest and clicky, elegant shield-shaped keys, the ThinkPad L380 Yoga is an absolute joy to type on. 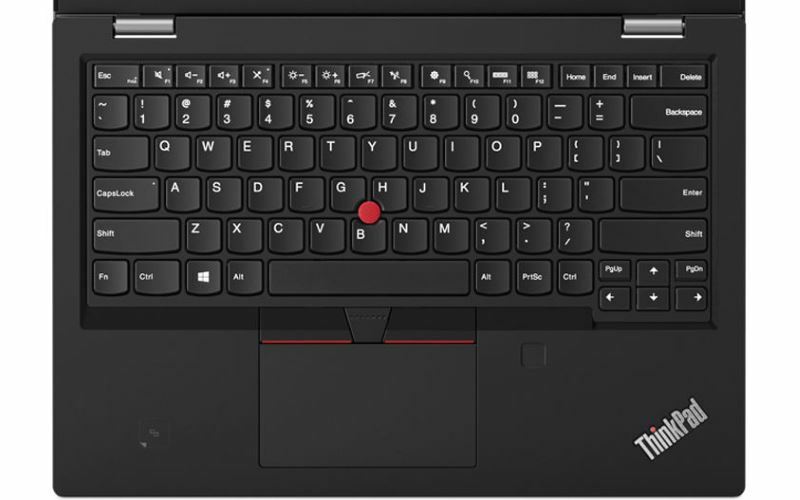 The L380 Yoga also has a TrackPoint, characteristically located between the B, G and H keys. The red rubber cap has ideal grip, while the three dedicated buttons sit below the keyboard. These are all of very good quality, with their pressure point being crisp and the stroke rather short. As the L380 Yoga is a convertible, the TrackPoint and touchpad are not the only mouse replacements. There is a ten-point capacitive touchscreen that supports pen input, the display reacting perfectly to either input method. The ThinkPad Yoga has a decent selection of ports. The left side packs two USB-Type-C ports, one USB-3.1 port with always-on charging, and an HDMI-1.4 port. On the right, you will find a secure-lock slot, one mini RJ45 port, another USB-3.1 port, a microSD-card reader, a headphone/microphone combo jack, an external power button, and the stylus port.